On the 70th anniversary of Israel’s independence, the U.S. embassy was moved from Tel Aviv to Jerusalem. Moving the embassy to Jerusalem is a symbolic gesture that recognizes the city as Israel’s capital. Jerusalem is home to some of the most important historical and religious sites in Judaism, which is why moving the U.S. embassy there is so important for Israelis. While the embassy only opened on Monday, the U.S. originally planned for its move from Tel Aviv in the Jerusalem Embassy Relocation Act, passed in 1995 under the Clinton administration. Bill Clinton, George W. Bush, and Barrak Obama all promised to recognize Jerusalem as Israel’s capital and move the embassy there during their presidencies, but failed to follow through. Pro-Trump poster in Jerusalem, from VOA. 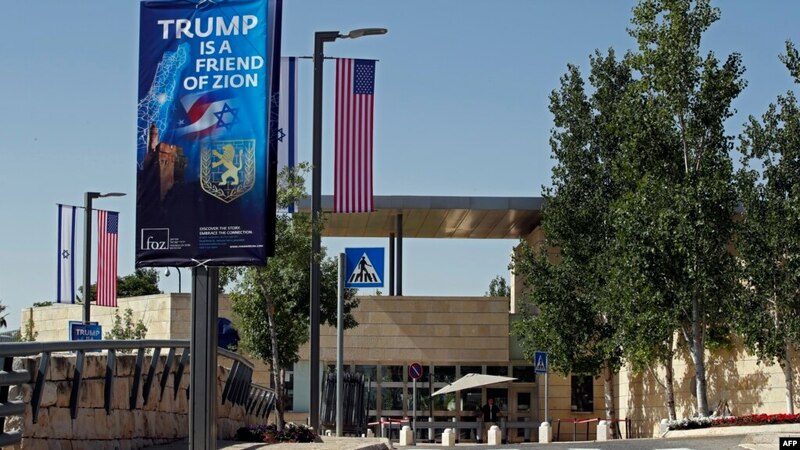 Jerusalem’s Friends of Zion Museum will also be opening an exhibit dedicated to Trump and a square in Jerusalem will be named after the United States for the president’s continued support of Israel. President Trump recognized Jerusalem as Israel’s capital back in December, which was denounced by the UN and sparked riots in Gaza. Trump could not attend the opening because first lady Melania Trump underwent a kidney surgery and was in recovery the same day. However, Ivanka Trump and Jared Kushner attended on the president’s behalf. More details to follow | Image of Jerusalem from The Independent.